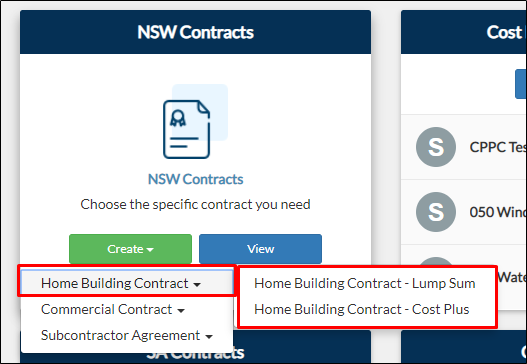 From your project page, go to Pre-Construction > Create > Home Building Contract from the NSW Contracts tile. 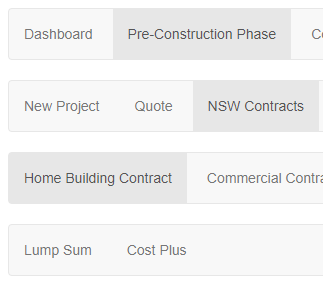 From your navigation bar, go to Pre-Construction Phase > NSW Contracts > Home Building Contract. Type it in on the search bar located on the upper right corner of your portal. 2. Select the type of Home Building Contract you want to submit. 3. You will be directed to the page of your chosen contract. Note: Project Name and Project Address fields are hidden if the form is accessed inside the project since it is already populated. 4. Fill out the fields. 5. If you selected the Lump Sum contract, you can fill out the Progress Payments- Stages of Work using the Copy from Quote or Copy from Quote Journey buttons. 6. If you selected the Cost Plus contract, you can fill out the Estimated Contract Sum using the Copy from Quote or Copy from Quote Journey buttons.